The Standard Model 91 Adjustable Fork Pallet Lifter is a great solution when handling a wide range of pallet sizes. The forks easily adjust to the desired location and locked into place with the adjusting tool stored directly on the lifter. Converts overhead crane into lift truck. Pry bar adjustable forks to handle multiple pallet sizes. The Model 92 Hand Wheel Adjustable Fork Pallet Lifters is a great solutions when handling a wide range of load sizes. The hand wheel makes changing the fork spacing fast and easy, simple turn the wheel until the fork spacing is in the required location for each load. Hand wheel adjustable forks for ease of adjustment. Pallet Lifter Frame with fixed forks width for handling loads similar in size and shape or repetitive handling of the same size load. Double frame designe for heavy capacities. Use your crane to handle a wide range of loads. 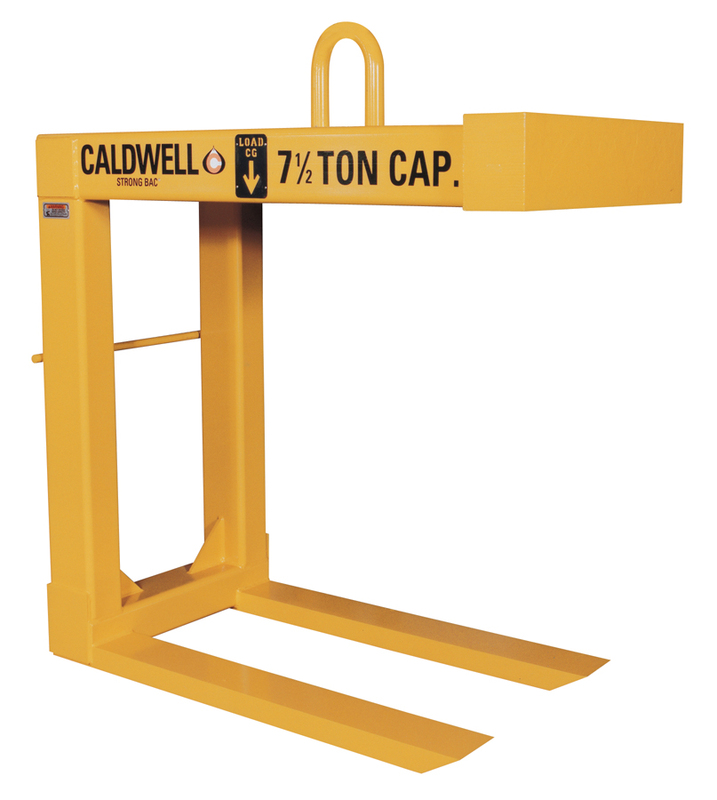 Once the bail pin is set the pallet lifter remains balanced whether full or empty to make the job faster and safer. Adjustable bail provides for balanced handling of items with different load centers. Adjustable throat allows for the correct handling of higher stacked loads. Adjustable forks allow for proper placement of the forks spread. The auto return bail automatically levels empty pallet lifter saving time and effort. Heavy duty construction for years of trouble free service. Wheels allow for movement of lifter without crane. Wheels allow for movement of unit without crane. Dual lift points eliminates need for counterweight. Extremely lightweight for ease of handling. Dual lift points to eliminate the need for a counter weight. Maintenance free - no moving parts. Forged forks gives ease of adjustment. Smaller fork sizes gained using forged forks. Double frame design for heavy capacities. Forged forks allow for smaller fork sizes.